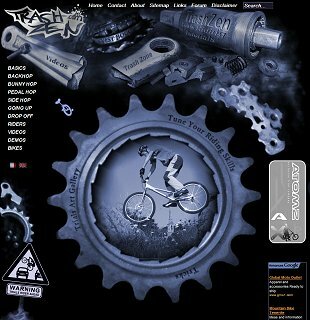 TrashZen was designed from scratch as a comprehensive online tutorial to help mountain bikers and riders from all horizons improve their riding skills. At the time of launch (summer 1998), there were simply no illustrated tutorials available on the web. Not finding any decent learning material on the web, I decided to post my observations as I progressed in this sport, later came the illustrations. A detailed analysis of each move, as I came to understand and practise them, will help beginners crack some of the non-trivial or counter-intuitive techniques. 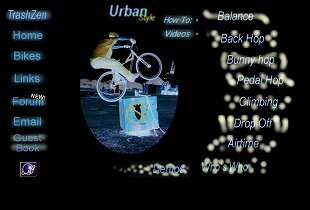 All the basics are covered with extensive tips and videos (the best way to learn any move is by far to see it performed by other riders and then try it for yourself. 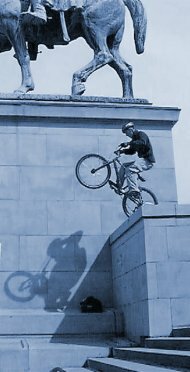 Most advanced and expert riding techniques are covered too, and new pages are being built as the techniques evolve. But if you feel some techniques are missing or could be better explained, please let us know. Your feedback is very much appreciated and could help fellow riders. You are about 5,000 unique visitors to consult TrashZen every month (in over 8,000 visits across 50,000 page views). Well... It's all about trashing your bike around, but with the Zen feel of full control in the air. It is like if time had stopped during these little tricky instants of zero gravity, during a big gap jump or during a perfect move. The word conveys the Zen side of mental preparation, Trashed by the occasional failure or crash... Still not very clear?...hmmm... well... You'll get a clearer picture by riding Trials. Most photos and videos by local friends, unwilling relatives, and my loyal camera-tripod. 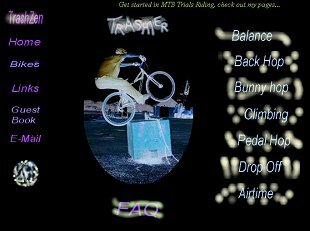 If you would like to sponsor some of these pages with MTB or trials' specific material, you can get in touch with us through the Feedback/Email page. Else, enjoy the tutorials and get on that bike to sort out your skills!